Nurture (verb): 1. To give tender care and protection. 2. To encourage to grow, develop, thrive, and be successful. 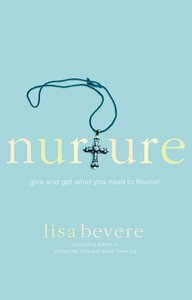 Lisa Bevere has to be one of my favourite speakers and writers. She empowers women to be who God has called them to be and to make a difference in the world around them. Nurture reminds us to be there for each other. It shows us how all generations of women matter and all have something to offer. I enjoyed reading this book.